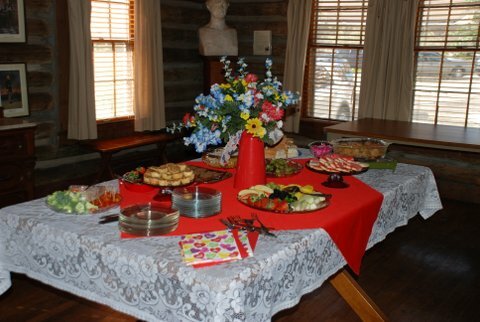 The Pioneer Memorial Log House is open to the public the third Saturday of most months from 1-3 PM. Admission is free and docents are available. Group tours are available by reservation. 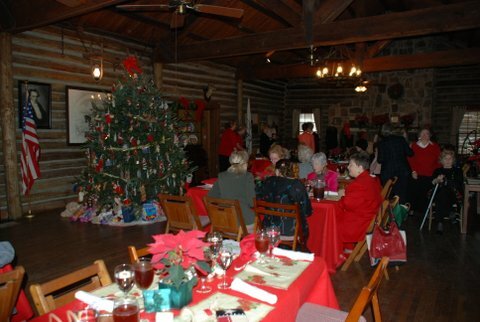 Tours of the Log House are available for senior groups, scout troops, and school groups free of charge. NO OPEN HOUSE 3/16/19 AND 4/20/19 due to restoration work at the Log House. Inquiries can be directed to Luanne Zacek, at lzacek@hotmail.com . As the year 1936 approached and plans for celebrating the centennial of Texas’ independence from Mexico developed, members of San Jacinto Chapter, The Daughters of the Republic of Texas, considered how they might participate. 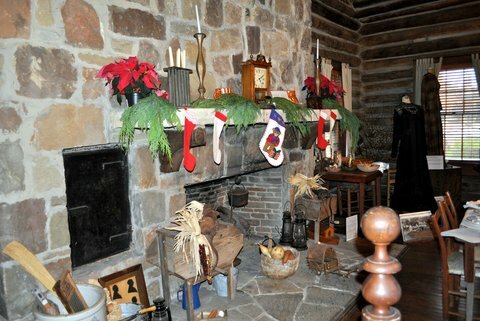 Mrs. George (Sarah Groce) Berlet is credited with the inspiration to build a log house that could be used as a hospitality center for many of the activities that were to take place. In the fall of 1934 she shared with chapter members her idea, along with drawing of how it should look – with a wide gallery at the front that would welcome visitors. Her rough sketch became the basis for the subsequent design of the house as later interpreted by the architect, Harry Weaver. The idea was enthusiastically received and the Pioneer Memorial Building Committee was formed, ultimately composed of Mesdames Frank (Roxalee Smith) Andrews, George (Virginia Turley) Baldwin, Berlet, Eugene T. (Mary Belle Smith) Harris, Fred (Sadie Lee) Harris, Madge Williams Hearne, Carrie F. Kemp, John M. (Lucille Ware) Nagle, H. H. (Laura Carnal) Uerkert, Thomas (Rosa Allen) White, and Miss Mary Todd. Mrs. Earl Ramsey, chapter president, was an ex officio member. Mesdames Berlet, Hearne, Kemp and Miss Todd immediately met with then Houston Mayor Oscar Holcombe and secured his promise of support. 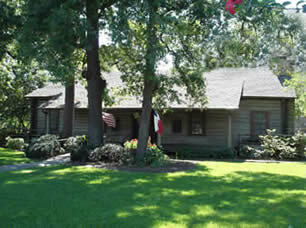 On February 13, 1935, the committee presented to Houston City Council the proposal to construct a pioneer shrine “as a landmark for all time and a mecca for Texas Centennial visitors and celebrants in 1936.” The Daughters’ request to locate the log house on city property was approved by the council, with the location to be determined later. All three Houston newspapers covered the meeting and reported on it in their February 14 editions. The city of Houston donated land in Hermann Park in honor of its founders, brothers John K. and George Allen. A contract was signed with builder John MacKay on November 27, 1935, and work begin the next day. 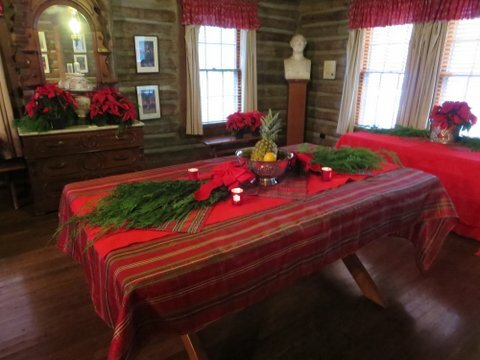 More than 250 pine logs were provided by Robert Morris, president of the Sons of the Republic of Texas at that time. They were cut, peeled and saddle-notched. Stones and bricks from early Texas homes were gathered to use in the construction of the large fireplace that spans one end of the building. Although not completely finished due to weather conditions, the building was dedicated on March 2, 1936, the 100th anniversary of the Texas Declaration of Independence from Mexico. Mrs. C. E. (Marian Hearne) Thornall, daughter of Mrs. Hearne and great granddaughter of Sam Houston, ‘christened’ the Log House with water from the Brazos River. Upon completion, the house was furnished with period pieces that reflect the formative period of the Texas Republic. Mrs. J. G. T. (Orlean Allen) Milby contributed funds for a pair of chandeliers made from old wagon wheels rimmed with lanterns, which Mrs. Hearne found in an antique store on Washington Avenue. A spinning wheel was placed near the hearth alongside a rocking chair with a rawhide seat. Two paintings of Texian scouts galloping across the prairie were given by E. N. Gray, a well-known Houston physician and historian, and a grandson of William Fairfax Gray. They are believed to have been painted around 1840 by Harriet L. Rather. Mrs. Penelope Lingan, a Houston artist, presented a bust of Sam Houston in honor of Mrs. Hearne, the general’s granddaughter. In November 1940, Sinclair Refining Company donated to San Jacinto Chapter a small house, which was moved from its Montrose location to the rear of the Log House to be used as a caretaker’s cottage. In 1950, the Log House and the cottage were moved a short distance to the present location to accommodate the expansion of the Houston Zoo. Each log and stone in the Log House was carefully numbered before it was disassembled and transported to its new site. During the Texas Sesquicentennial in 1986, the Texas Historical Commission recognized the Log House with an historic marker. On the grounds, the Texas Heritage Garden features plants and trees native to the state as well as those brought by pioneers as reminders of their former homes. More than 100 varieties of roses bloom throughout the year, including a Sam Houston Rose developed by the Antique Rose Emporium during the bicentennial celebration of General Houston’s birth in 1993. On the front lawn is a tree grown from a walnut harvested on the grounds of the school in Maryville, Tennessee, where Sam Houston taught as a young man. A large iron sugar kettle from the China Grove Plantation in Brazoria County, home of General Albert Sidney Johnson, rests near the front door of the house. 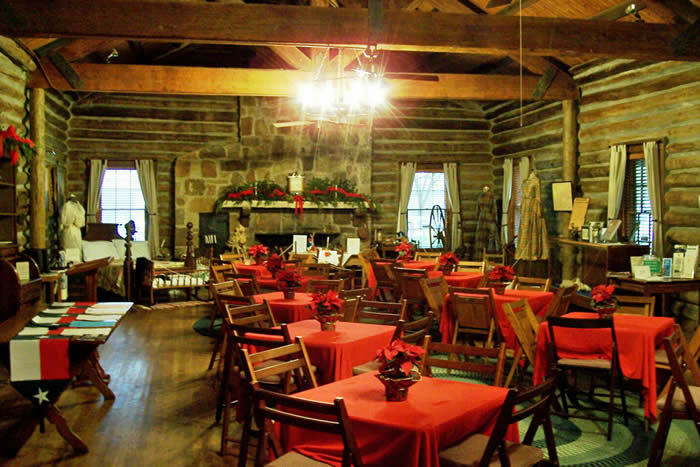 Sitting at the edge of the Texas Medical Center in the shadow of world-famous healthcare institutions, the Log House offers a contrast between modern-day Houston, one of the nation’s largest cities, and its beginning as a muddy, backwoods town of early 19th century Texas. 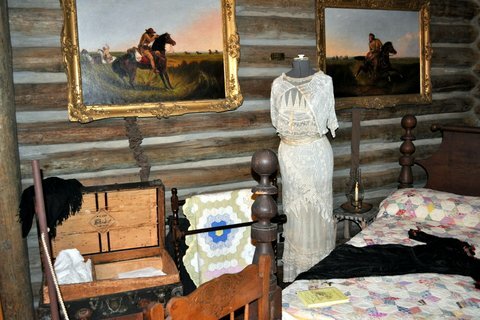 In addition to being the meeting place for San Jacinto Chapter and other historical organizations, it provides schoolchildren and other visitors with a glimpse of pioneer life in early Texas. 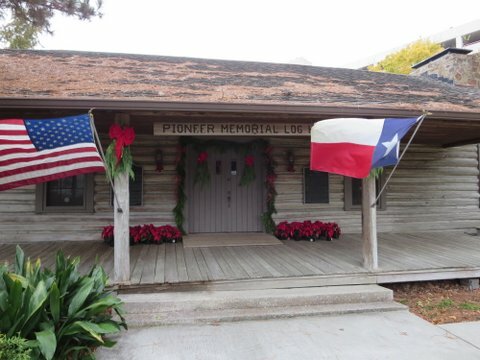 Harris County has issued a Proclamation naming March 2, 2011 as Pioneer Memorial Log House 75th Anniversary Day. Please click on the link below to see the scrapbook that is a collection of pictures, letters, and articles that detail the immense amount of planning and work that went into the creation and building of the Log House. The newspaper articles and pictures contained herein have been reprinted with permission, copyright Houston Chronicle Publishing Company. All rights reserved.